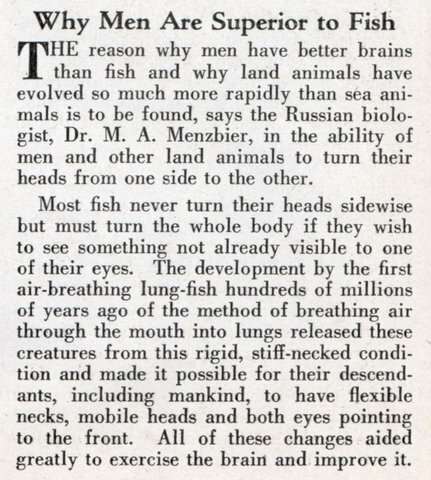 THE reason why men have better brains than fish and why land animals have evolved so much more rapidly than sea animals is to be found, says the Russian biologist, Dr. M. A. Menzbier, in the ability of men and other land animals to turn their heads from one side to the other. Most fish never turn their heads sidewise but must turn the whole body if they wish to see something not already visible to one of their eyes. The development by the first air-breathing lung-fish hundreds of millions of years ago of the method of breathing air through the mouth into lungs released these creatures from this rigid, stiff-necked condition and made it possible for their descendants, including mankind, to have flexible necks, mobile heads and both eyes pointing to the front. All of these changes aided greatly to exercise the brain and improve it. 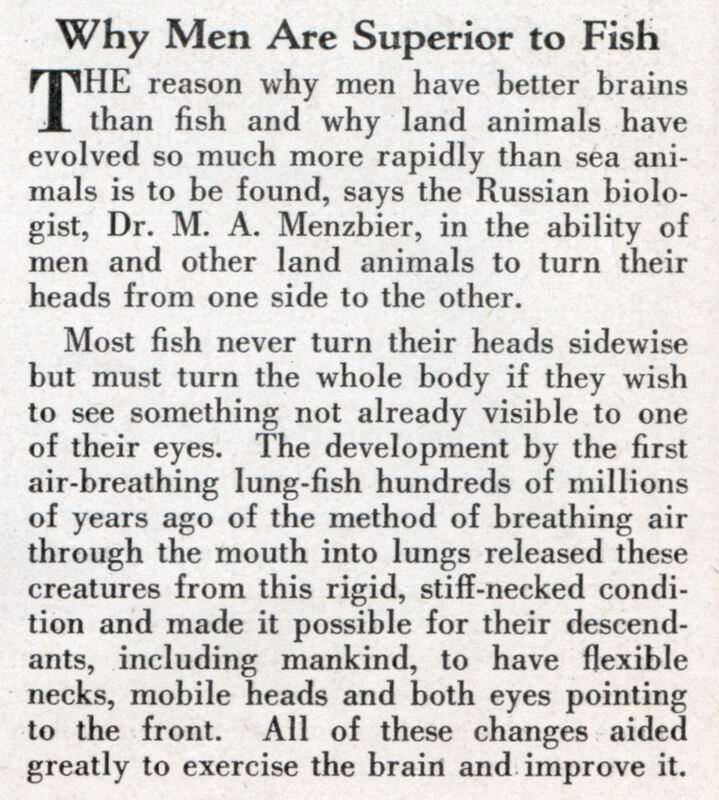 So we’re better than fish because we can turn our heads? Oh Crap ! There’s a shark behind me. Sure am glad I’m not a fish, I’d have never seen it coming. 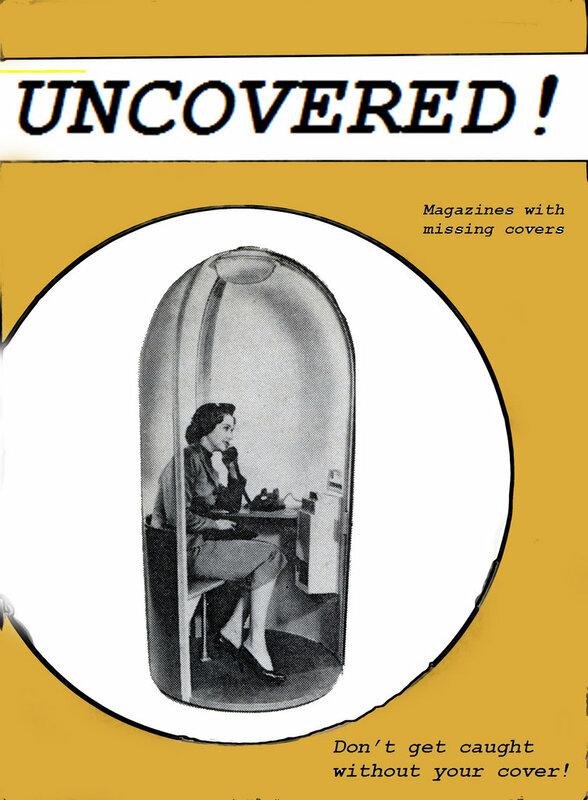 Damn – and I thought it was the whole ability to survive out of water, walk on land, and communicate! Didn’t hands with opposed thumbs have something to do with our success? An ostrich can turn its head in any direction with greater ease and range than any of us, but I’ve yet to see one of them doing anything suggesting greater evolution. women still only make 80% of what a fish makes. You guys shouldn’t mock the neckless SEA KITTENS. I didn’t realize there was even a controversy.